The $18 million project to transform Yuhua in Jurong into Singapore’s first “green” neighbourhood is well under way. Singapore faces limitations in its potential to further reduce emissions. National Statement of Singapore Delivered by Dr Vivian Balakrishnan, Minister for the Environment and Water Resources at the UNFCCC COP-20 High Level Segment in Lima. Free mentorship for green aspirants. Extreme weather and rising sea levels among future environmental challenges. Tropical Marine Science Institute has found a way to prevent its centre from being shut down. Popularity of hybrid vehicles picks up. Talks are ongoing on an animal adoption centre and a dog run for East Coast Park. Solar panels will be installed at 680 HDB blocks and three HDB-owned commercial and industrial properties by end 2016. The upcoming expansion of Changi Airport will take place on higher ground to guard against rising sea levels. Singapore’s carbon intensity fell by 30 per cent between 2000 and 2010. The new $29-million extension at Sungei Buloh Wetland Reserve adds an extra 31ha to the original 130ha reserve. The Government has asked firms to submit proposals for an electric car-sharing scheme trial. New breed of urban farmers turning flats and corridors into farms. Petrol vehicles to adopt Euro VI emission standards from September 2017. A series of initiatives and programmes for Pulau Ubin over the next few years were announced during Ubin Day. PUB has invited companies to submit proposals to study the extent and impact of the risks of coastal and inland flooding due to climate change. PM Lee outlines Singapore’s Smart Nation vision. Lim Chu Kang farms will be uprooted to make way for military uses. NEA and SECDC have inked a three-year partnership with 10 schools in the South East district to groom students as “Eco Kepalas”. Waterways Watch Society to set up an eco-village at Kallang Riverside Park. NEA and the Singapore Standards Council announced the implementation of Singapore Standard SS587, which will provide guidelines on how businesses can get rid of their electronic waste responsibly. Bright Spots Challenge and No Waste Days Challenge launched at the opening ceremony of Clean and Green Singapore 2015. Ground-Up Initiative to build Kampung Kampus, a community learning campus at the former Bottle Tree Park in Khatib. The revised Sustainable Singapore Blueprint 2015 outlines Singapore’s plans to be cleaner and greener. The Singapore Institute of International Affairs is looking to launch a haze tracking portal in efforts to clamp down on errant parties causing transboundary haze. The Animals and Birds (Amendment) Bill was passed in Parliament, more than two years after a committee was set up to look into strengthening legislation on animal welfare. Singapore needs a national commitment to cycling. More measures needed to tackle food waste. Study found that manufacturing companies are likely to benefit more from installing solar panels to save on electricity costs. New Springleaf Nature Park near Mandai Road opens. New climate exhibition to promote knowledge and action on climate issues. Singapore will start building a hybrid micro-grid at the Semakau Landfill next year, to show how renewable energy from the sea, sun and wind can be combined with other technologies to provide a stable source of electricity. Underwater World Singapore criticised for ‘sub-standard’ animal living conditions. Rising tide of litter on Singapore’s shorelines. $15 million in government grants has been awarded to seven NTU and NUS research teams to develop clean energy sources and small-scale power grids. More people are trading in their old commercial diesel vehicles for newer and greener ones under a government scheme which rewards them for doing so. MEWR has responded to recent findings in the latest WWF report that showed Singapore’s environmental ranking had worsened. The Green Mark scheme for green buildings will soon consider the basic carbon footprint during the import of key components and systems of buildings. NTUC FairPrice introduces measures to tackle food waste. LTA is reviewing the carbon emissions-based vehicle scheme that rewards or penalises motorists based on the amount of carbon dioxide their cars emit. 1,000 sensors deployed to monitor air, water quality and public safety, as part of the first phase of Singapore’s Smart Nation Platform rollout. Singapore’s environmental ranking has worsened in the latest Living Planet Report published by WWF. PA launches Water-Venture Committee in Pasir Ris to keep the waterways clean. Recycling gets easier with a bin at every HDB block. New emissions standard for bikes and scooters kicks in. SGX is planning to mandate that all listed companies publish sustainability reports in a “comply or explain” approach. New energy management information tool for manufacturing companies. Part of Orchard Road to go car-free once a month. PUB awards 28 companies for ‘exemplary’ performance in water efficiency. Singapore ratifies the Doha Amendment to the Kyoto Protocol on climate change action. Bukit Timah Nature Reserve will be closed for restoration works and will reopen partially during weekends in April next year. 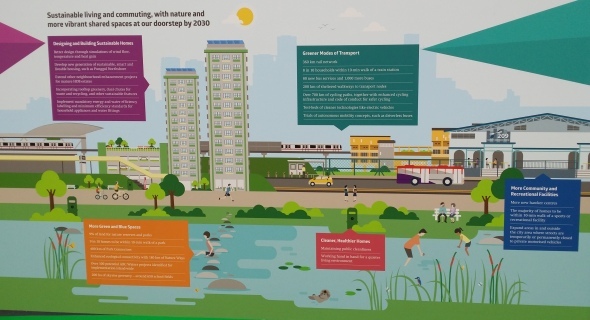 HDB unveils green living plans for Bidadari and Tampines North. NEA will conduct a survey to look at how Singaporeans shop for, eat, cook and dispose of their food, as part of efforts to cut the growing amount of food waste. In response to the Government’s plans to redevelop Mandai, nature groups called for buffer zones to be created and for the minimisation of any impact on the ecosystem. Eugene Heng, founder and chairman of Waterways Watch Society, received the President’s Award for the Environment. LTA plans to place solar panels on the roofs of two new train depots by 2016. S$52 million fund for research on green building solutions launched. Minister Vivian Balakrishnan said it is important that companies be responsible for their impact on the environment, especially following the recent haze episodes. 10 individuals and groups recognised at the first Singapore Advocacy Awards. Singapore’s third Green Building Masterplan launched. The Government is looking to expand the use of solar power on its properties beyond HDB flats to schools and military camps. Singapore’s efforts to grow its water industry into a global leader has paid off, with more companies joining the sector and others making headway into global markets. The Singapore maritime industry’s aim to achieve sustainability has led to a number of key green initiatives in recent years. Singapore farmers can tap on S$63m fund to boost yields and productivity. Public offer suggestions to enhance Pulau Ubin. Energy labels on air-conditioners, refrigerators and clothes dryers will be revised to make it easier for consumers to choose more energy-efficient models. Singapore’s food security dependent on diversifying sources. Energy-intensive firms could see returns from sustainability efforts in under 3 years. The development of energy-related technologies is the focus for the next phase of the Pulau Ubin Micro-grid Test-bed. Solar power could supply 30% of Singapore’s electricity by 2050. A new volunteer group has been set up to deal with the monkey problem faced by residents living near the Bukit Timah Nature Reserve. Green cars cost $155m in tax breaks. Parliament passes Transboundary Haze Pollution Bill. Panasonic has set up an indoor farm to supply local restaurants and retailers with vegetables. Singapore’s sharing economy is on the rise. About 80 wild boars in the Lower Peirce area have been culled. The Government is investing S$100 million in two major R&D initiatives to improve overall building energy efficiency and research on green data centres. The Keep Singapore Clean Movement in schools was launched to get students to take ownership of the cleanliness of their school and the environment. NEA called for proposals to develop a technology roadmap for a sustainable waste management system till 2050. S$14 million awarded to advance solar energy research. EMA removes the “hard cap” of 600 megawatt-peak of solar energy that can be supplied to the grid. NEA to continue stepping up enforcement against litterbugs. SERIS has opened a new facility to develop and test new solar panels under one roof. Singapore to have its first Marine Park on Sisters’ Islands. Singapore to independently assess impact of Johor reclamation projects. NEA will be relocating more than 600 coral colonies at Semakau Landfill’s lagoon to Sisters’ Island. Inter-government agencies are expected to release long-term plans to safeguard Singapore against projected climate change effects under the Resilience Framework. An Environmental Impact Assessment of the upcoming Cross Island MRT Line on the Central Catchment Nature Reserve will start immediately. Sustainable energy and water use in the industrial sector discussed at the third focus group discussion reviewing the Sustainable Singapore Blueprint. Growth in waste management sector an opportunity for local companies. A 22-kilometre water pipeline from the Murnane Service Reservoir to the city will be completed by 2019 and about half the pipeline will be laid underneath the Rail Corridor. SIA Cargo to stop carrying shark’s fin. HDB has called for the largest solar-leasing tender to date, under which solar panels will be installed on the rooftops of about 500 HDB blocks managed by the Marine Parade, Jurong, Tampines and Sembawang town councils. Dengue cases on the rise as weather heats up. Singapore measuring its carbon inventory from plants and soil. Littering and keeping community spaces clean discussed at the second focus group discussion reviewing the Sustainable Singapore Blueprint. Singapore will adopt the Euro 6 emission standard for petrol and diesel vehicles as early as 2017. BCA has released environmentally-friendly guidelines for landlords and tenants that can be adapted as part of a Green Lease agreement. NEA is exploring the use of biological control methods to control the spread of dengue in Singapore. The Sharing Economy Association (Singapore) launched to encourage people to rent and share items rather than buying them. NEA is studying the feasibility of constructing a Multi-Storey Recycling Facility that can house various recycling activities under one roof. World’s largest vertical garden in Singapore. 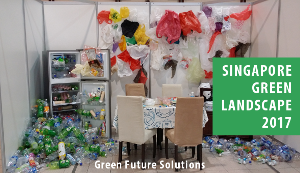 More than S$318 million worth of projects were announced at the second edition of the CleanEnviro Summit Singapore. SPCA calls on Resorts World Sentosa to release its remaining 23 wild-caught dolphins. Singapore starts its first fully-LNG operated power plant. JTC Corporation is joining hands with the Sustainable Energy Association of Singapore to work on energy efficiency solutions for buildings in JTC’s business parks and industrial estates. Firms recognised for their 3R efforts by NEA. The new Integrated Waste Management Facility will be co-located with the new Tuas Water Reclamation Plant, to help optimise energy and resource recovery. NEA awards tender to build metal recovery facility for incineration ash. PM Lee: Singapore continues to develop innovative solutions to make it liveable and sustainable. Waste reduction and recycling discussed at the first focus group discussion reviewing the Sustainable Singapore Blueprint. More shopping malls in Singapore are going green. Demand for environment impact studies grows. Singapore haze advisory panel meets for first time. Singapore Institute of International Affairs to organise first-ever Singapore Dialogue on Sustainable World Resources. Conversations on Sustainable Singapore held to gather views for the Sustainable Singapore Blueprint review. PUB is building rooftop solar panels at Choa Chu Kang Waterworks and installing floating solar systems on Tengeh Reservoir. About 250 shopping malls and hotels will need to report waste and recycling data to NEA from next year. Uphill task to get homes to cut waste. A government-funded project is under way to map and analyse every rooftop in Singapore for solar power. S$20m initiative to make NTU among greenest universities. Recycling of food waste yet to catch on in Singapore. Singapore Food Manufacturers’ Association is looking at developing a set of food standards with Singapore Standards Council in a bid to reduce food waste. Singapore to beef up nuclear technology expertise. More local companies and organisations are seeking ways to integrate green features into their work spaces. WWF and the Marine Stewardship Council are organising Singapore’s first Sustainable Seafood Festival. Severe haze last year could have influenced climate change survey results. New PSI reporting system kicks in. Corporate social responsibility (CSR) is catching on among companies in Singapore. Sembcorp Industries has started building its largest energy- from-waste facility in Singapore. Lights off for Earth Hour in Singapore. Washing machines that are not water efficient will no longer be sold in stores. PUB team to study use of groundwater. Rise in number of animal welfare groups. Four in 10 Singaporeans think government is responsible for taking action on climate change. Singaporeans can soon compare water usage with their neighbours. More wild otters sighted in Singapore. NEWater has won the “Water for Life” United Nations Water Best Practices Award 2014. 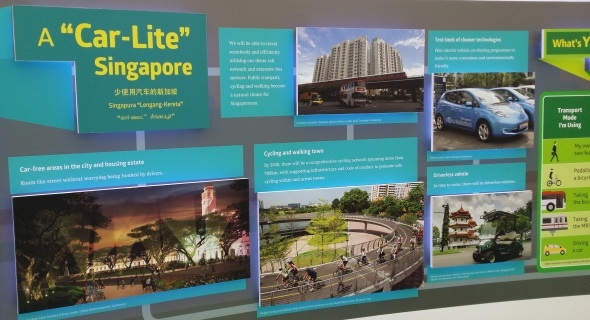 LTA to develop a road map for electric vehicles. Large water users have to submit usage plans from next year. Committee of Supply 2014 – Speech by Minister of State Maliki Osman on “Food Security”. Committee of Supply 2014 – Speech by Minister of State Desmond Lee on “Working Together to Build a Liveable and Green Singapore”. Speech by Dr Vivian Balakrishnan, Minister for the Environment and Water Resources, Committee of Supply Debate. Speech by Ms Grace Fu, Second Minister for the Environment & Water Resources, Committee of Supply Debate. Lastest energy updates from COS Debate 2014. PUB and Japanese firm jointly opened a S$10.3 million demonstration plant capable of treating and recycling industrial used water. Singapore opens first LNG terminal and plans for 2nd terminal. Singapore is experiencing its longest ever dry spell. Vehicle owners will be given further incentives to go green. Tweaked Environmental Public Health Act with harsher penalties for litterbugs passed. Marine experts and nature enthusiasts have been documenting the damage to the Southern Islands after vessel collisions left the shores oil-slicked. The dry spell in Singapore has prompted PUB to ramp up the supply of NEWater and desalinated water to maintain water levels in the reservoirs. Coney Island to open to public in 2015. Nature groups have submitted their ecological study of the Central Catchment Nature Reserve to LTA, which will use it as a reference for conducting the EIA for the Cross Island MRT Line. SEC to hold a series of dialogues aimed at crafting a common vision for the environment, as part of a national exercise to review Singapore’s approach towards the environment. Youths in the South West District can now get funding for their efforts to tackle environmental issues affecting their community. Testing of electric cars in Singapore moves into second phase. Nature Society has taken issue with the Government’s latest land-use draft masterplan, calling it “embarrassingly negligible” in its commitment to conserving biodiversity. All new BTO flats to sport suite of eco-features.